We went “live” with our solar installation on April 9, 2018. To recap, we’ve got 8.125 kW of generation capacity from our roof-mounted array of 25 panels, each capable of 320 watt gross output with a Powerwall 2 and a 240V Tesla car charging station. 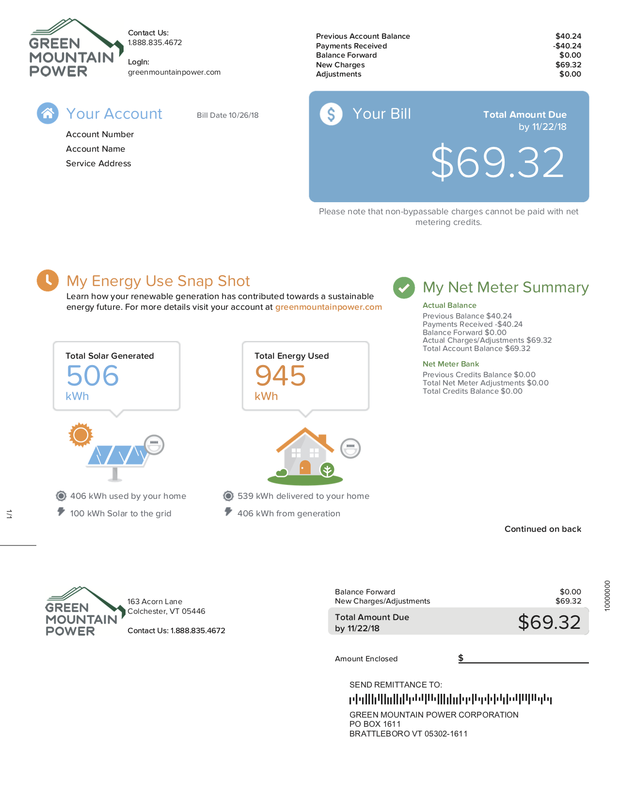 Since it has primarily just been my wife and I in the house full time for the last several years, our average monthly electric bill has been approximately $100–110 based on usage of around 550–600 kWh per month. 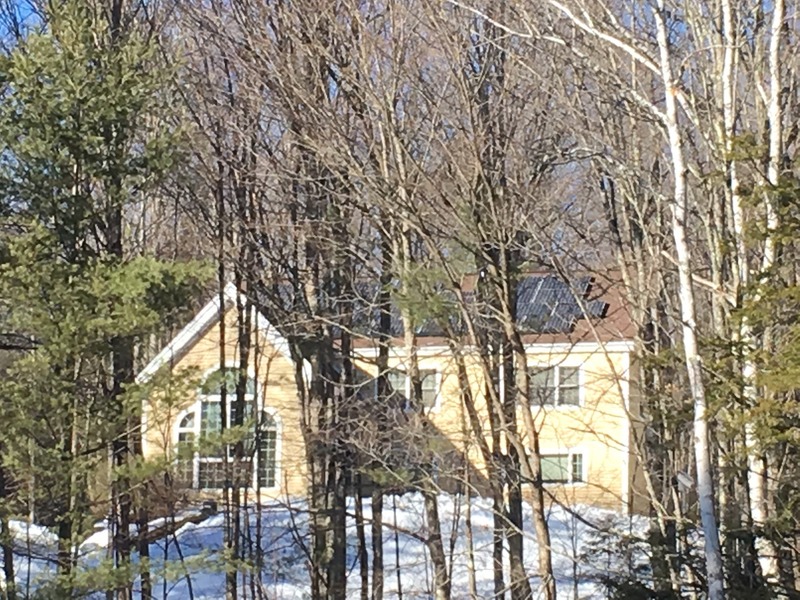 The house is located in West Woodstock, Vermont, proving full well that you don’t have to be in Arizona or California to have a successful solar generation system. Green Mountain Power (GMP), our utility provider, is currently charging a flat rate of $0.17 per kWh. 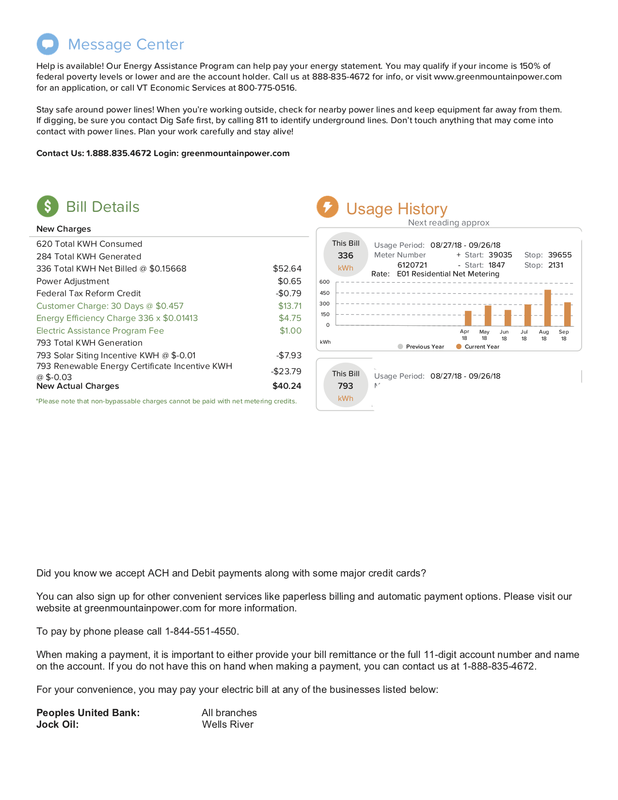 As part of our 10 year fixed credit net metering contract, we are paid $0.04 per kWh generated. That is every kWh generated by our array, whether it goes to charge our battery, power our home, or back to the grid. We were also charged $110 as an upfront cost from GMP to install our “Gross Solar Meter,” even though Tesla Energy did 99% of the work by installing the meter bucket and all associated wiring and the utility showed up for just about 10 minutes to install the meter. I’ve included a few of our monthly utility bills on the bottom of this article for you to review. For the usage period of 4/25/2018 thru 10/26/2018, our total amount paid to GMP was $231.03. This reduces to an average monthly charge of $38.51. 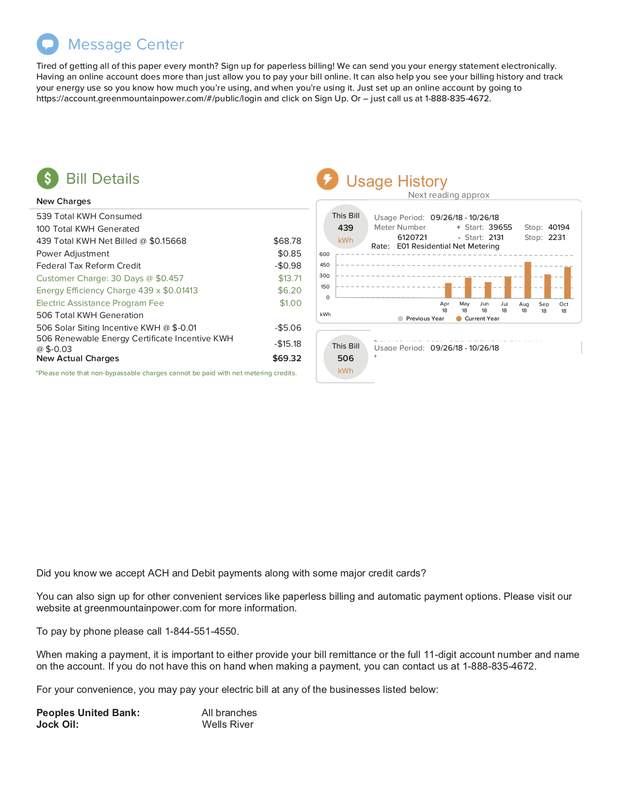 The lowest monthly bill was $18.80, the highest $69.32. During the same period, our total energy used was 7506 kWh, while our total solar generated was 5409 kWh. Not bad, you say? But wait. It gets better. The spike in usage through those six months was due to the fact that I was charging our Model S every weekday night from Sunday through Thursday (at a minimum) — on average from 20% to 90%. My commute is 190 miles a day round trip. Yeah, I know. However, I refer you back to the first paragraph. We are in VERMONT! That’s the Green Mountain State. Also can be referred to as the No Industry State. Bring your trust fund, buy your second (or third, or fourth) home. But I digress. Additionally, I would have changed the oil and filter on the Golf an average of four times during that same period at a cost of $60 each time and the fuel filter at least twice at a cost of $22 each time. I buy my own supplies and do it at home — one of the few things still capable of being performed by the shade tree (in my case Modine heated) garage other than changing tires seasonally. Now, before you all say, “YEAH, BUT …,” indeed, there is no free lunch, or in this case free energy. At least, not yet. We have our 10 year contract with Tesla Energy, or their financial arm Mosaic. In the effort of full disclosure, our system has a cash value of $36,656.25. The cost of money from Tesla was 2.99%. Our current monthly payment is $257.24. Our first payment was in July of 2018, giving us a 3 month grace period from the date of commissioning. Remember that your contract with Tesla Energy will not have any upfront costs. A balloon payment of $13,513.74 is due Oct 2019 to maintain that monthly balance throughout the remaining life of the loan. We can forgo the balloon and have a monthly balance due of $379.46 for the 9 year balance. Too much math? It is for me. Let the comments begin! Oh, but wait — so, is it all worth it? As I have said in my previous articles: YAGOTTAWANNADOIT ! What’s it worth to you? Economically? Environmentally? Are you staying put in the house you installed it on? All of these decisions are up to the individual. I’ve said enough here. I’ve given you a basis for your own calculations, your own soul searching. It was worth it for me in my own mind. It’s America, folks. We’re still free to make our own decisions. At least, we are today. Bob Borsh is one of those individuals convinced he was born with petroleum products in his bloodstream. Hooked on anything with an engine from his earliest memories, he’s been working hard in recent years to flush the petrol and replace it with electrons. Raised in New Jersey, he and his family have lived in Woodstock, Vermont, in a home he designed back in the early '90s. 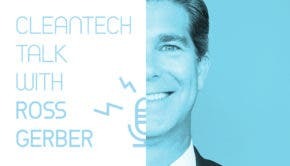 With a degree in mechanical engineering, he has worked in construction and project management his entire career. 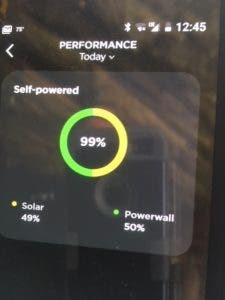 An owner of a 2016 Model S 75D, he has also had Tesla Energy install an 8.125 kW solar array and a Powerwall 2 at his home, which has been operational now since 9 April 2018.